What could be easier, math-wise, than a quilt block in a 10 inch size? Surprisingly, the 10" block is not the most commonly used size, (that would be the 12" block), but there are still many quilt blocks that fit into this category and here is my list of currently available patterns. 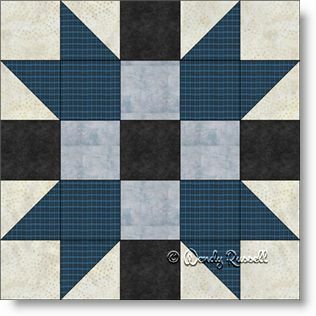 The Father's Choice quilt block is a perfect option for that special Dad. I have chosen to design this block using favourite colours of some dads that I know -- greys and blues. Of course, please feel free to change up the colours for your quilt block. This is an easy quilt block to make, as it is comprised only of squares and half square triangles -- the first pieced patch you will learn as a beginner. The two sample quilts illustrated are both designed using on point settings but look very different. There is no end to the creativity you can achieve by simply using your imagination.